I've been really lucky with the Mum friends I've made. I can honestly say that they have been one of the biggest help to me - in ways that I can't really quantify. There is nothing quite like bonding over the trials and tribulations of parenthood. One such friend is Sensitive Flour, who was in part my inspiration for returning to blogging. Seeing the range of excellent foods that she's made and shared since going gluten-free is nothing short of amazing. She's a baking queen too; I've had the pleasure to eat a plethora of her creations. 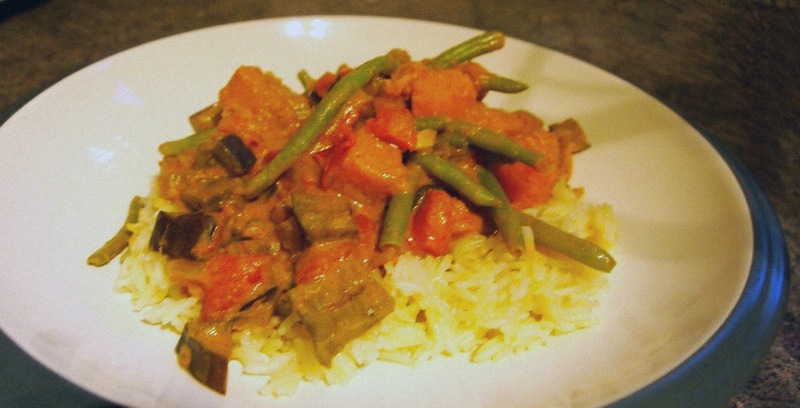 When I saw the recipe for Aubergine coconut curry I was keen to give it a go. Not least because the points come in quite low but it contains coconut milk which is a favourite of mine. I wondered how it would compare to Skinny butternut squash and aubergine as my intention was to switch out the lamb in the recipe with butternut squash. I also switched the onion for a shallot and the coconut milk for reduced fat coconut milk. Propoints: - 3 for the curry, 5 for the rice. Mist the wok with frylight and sweat the shallot for about five minutes - it needs keeping an eye on! Add the aubergine and fry over a medium heat for five minutes. Add the spices and garlic and cook for a further couple of minutes, ensuring that all of the aubergine is coated with the spices. Add the tomatoes and coconut milk and simmer, covered, for ten minutes. At this point, start on the rice. In a different pan, melt the butter on a low heat, being careful not to burn. Gently fry the garlic for a couple of minutes. Add the rice and coat it all in the buttery garlic, frying for a further minute. Add the stock, agitate with a fork and simmer, covered for around ten minutes. Return to the curry, adding the green beans and butternut squash. Heat through for eight minutes. The butternut squash should be beginning to break down and the green beans cooked through. Serve the curry on top of the rice! This worked out so well - a creamy taste with the smokiness of roasted butternut squash. As is always important with food whilst on a diet, it's filling. The key thing is that it doesn't feel like diet food and feels like an indulgent Friday night treat. We actually only used half of the mixture - D was in bed by the time this was made - I'm intending to replace a lunchtime soup with half of the remainder and tempting D with the rest. He's a keen fan of green beans so I don't think that will be too hard. I'll make this again - possibly with cauliflower instead of the aubergine next time.